Of London, peacefully at Victoria Hospital in London on September 8, 2014 in her 77th year. Cherished wife of 54 years to the late Martin McLay. Dear mother of Shaunna Stafford, Sherril Myles and Rusty McLay. Mother-in-law of Wes Stafford, Bryon Myles (deceased), Brad Adams and Beth McLay. Cherished "Nana" of Scott, Derek, Drew, Alli, Hannah, Cameron, Katie and Joey. Special sister to Merle and Bill Ellis, Norm (deceased) and Jean Thompson, and sister-in-law to the late Marian and Malcolm McDonald. 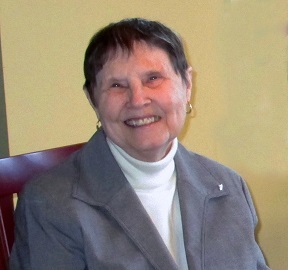 Family invite friends to gather at the Thomas C. Whitcroft Peninsula Chapel, 272 Berford St., Wiarton (519) 534-5341 on Saturday, September 13, 2014 from 10 – 12 pm, where a service to celebrate Vernice’s life will be conducted at 12 o’clock. Cremation has taken place. Interment in Eastnor Cemetery. Donations to War Amps Canada and Heart and Stroke.